On July 16, 2017, the members of ASEZ the university student volunteer group of the Church of God went out to turn H Street near Starburst Plaza into a “Mother’s Street.” This region has dirty streets with a relatively high crime rate in Washington D.C., USA. 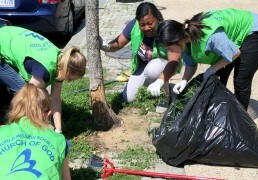 So, around 100 students of ASEZ from Korea and Washington D.C. held a street cleanup. The members cleaned the streets, picking up trash and cigarette butts, removing weeds, and sweeping piles of dust for about four hours. Washington D.C. is one of the regions that have high rates of AIDS patients in the USA, which requires caution when picking up needles or broken glass. So, the members followed through on the safety rules that they had learned in advance by putting needles in empty bottles and closing the caps before throwing them away. This way, they put their hearts into the work to improve the residential environment. As a result, 15 bags of trash [each 100 liter (26 gallons)] were collected. A local police officer, who watched their activity, encouraged them, saying, “While I was patrolling, I saw you cleaning this area. Surprised, I stopped and talked to you. What you are doing is a very important work to improve the environments of the regions people pay no attention to. Thank you for cleaning our region.” Meanwhile, their activity was broadcast on NBC4 and WUSA9 News.